I’m talking about a stack of another variety: the book stack. It’s not unlike the network stack, though, in that it, too, is a material-epistemic infrastructure. The fact that there have been numerous aesthetic explorations of the book stack in recent years suggests that this once-invisible piece of furniture has finally drawn attention to itself: perhaps because its shelves are emptying, as some folks switch to ebooks; or because those committed to the physical stack and its physical inhabitants are wondering how to rethink, reinvigorate, our systems for organizing, housing, and facilitating access to books. 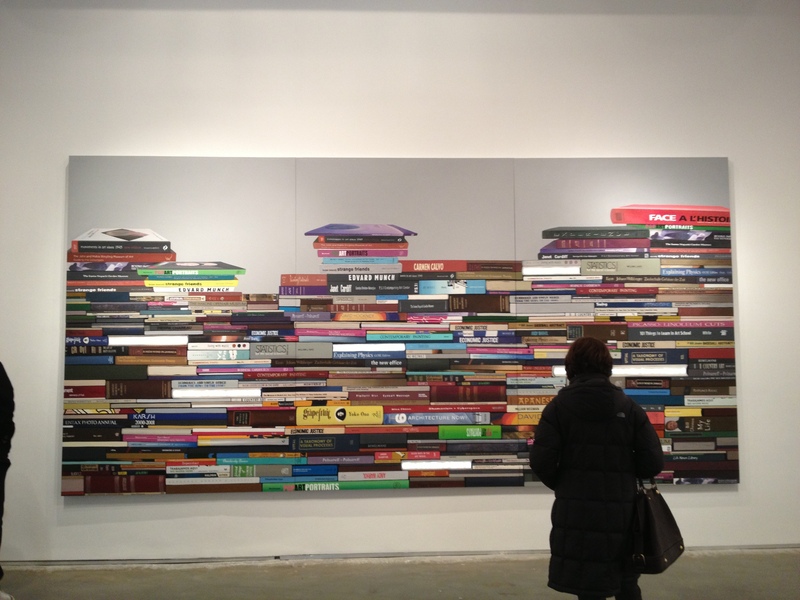 I’ve seen a few stack-related exhibitions in the past two weeks. I’ll address two here, and a third in a follow-up post. 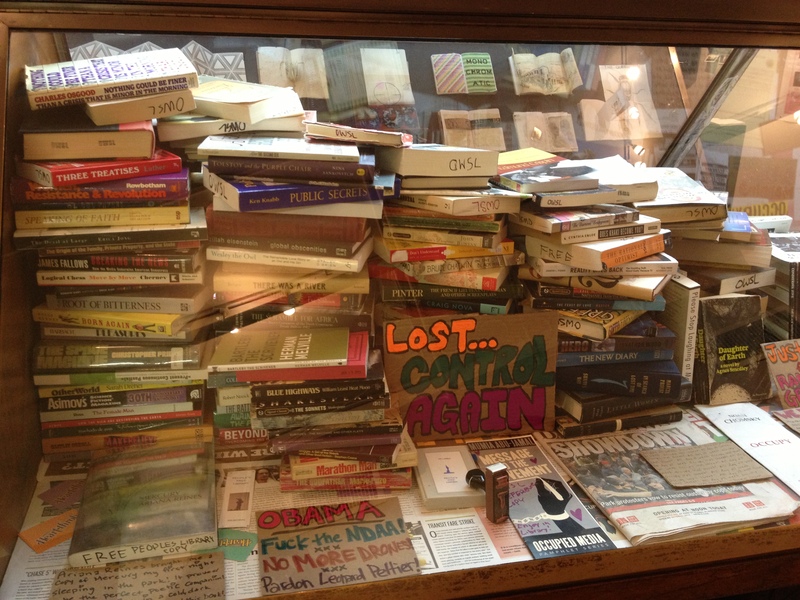 First, “Brother, Can You Space a Stack?,” at the Center for Books Arts, “presents thirteen art projects that re-imagine the library as a force for social change. Each project constructs a micro library of sorts that serves specific economic or social needs within the community.” I addressed a few of the projects on display here in my “little libraries” article (which those of you who read this blog regularly — anyone?, anyone? — are probably sick of hearing about). 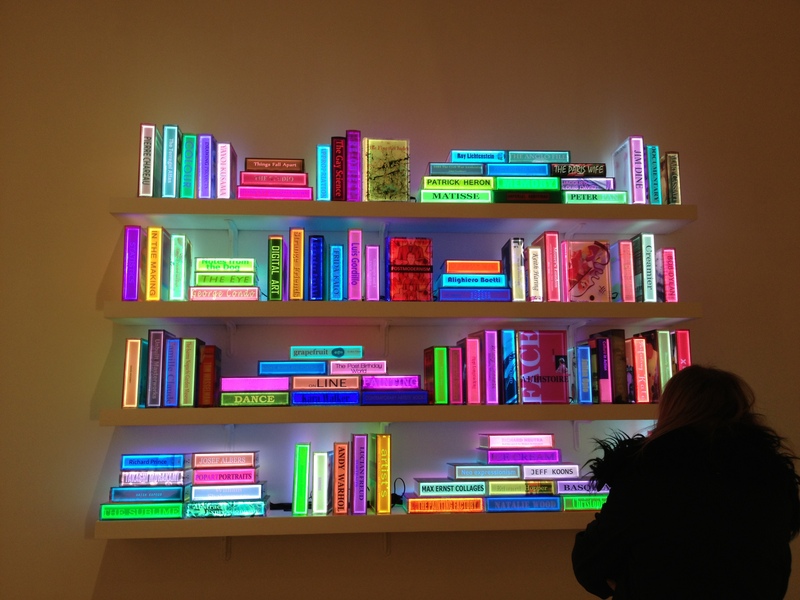 All, however, place triple emphasis on the material book, the places those books inhabit (which become public places by virtue of the books’ presence and the gathering of people around them), and the forms of social connection they generate. I have to admit, the wall texts were a bit too intense to read in situ, so I’ll wait to purchase the exhibition catalogue to learn more about the projects I’m not already familiar with. 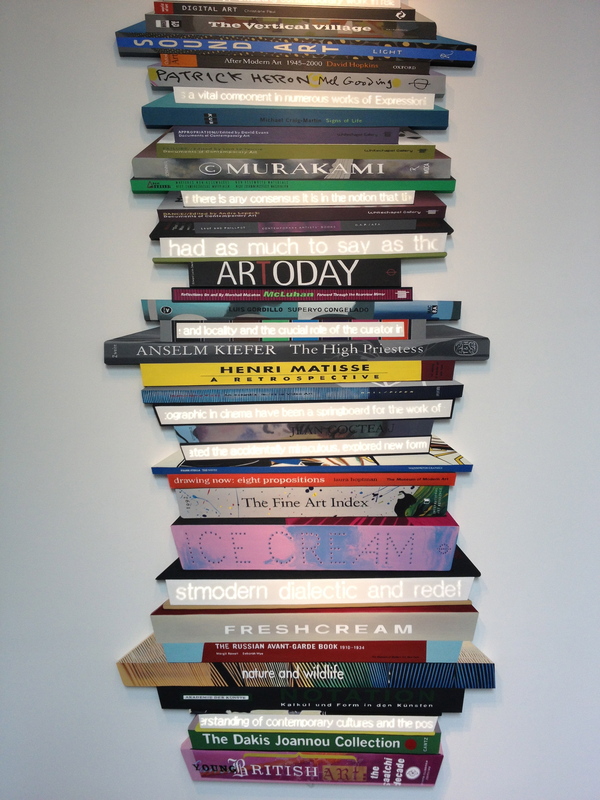 I appreciate the different approaches to stacking represented in the three variations on the theme we see above: the stack as bricks in a wall; the stack as variably arranged units of illumination or enlightenment; and the stack as precarious tower — each representing a different take on the state of the book as material object. The subject matter of these books is interesting, too; nearly all are art, theory, urbanism, and architecture books — some of which are among the “genres” best able to justify their continued existence in glossy, oversized print form. Before moving on, in the next post, to my third stack-related exhibition, I want to note two non-stack-related shows we saw on the same day we visited the two above — both of which nevertheless highlight themes present in the more book-centric exhibitions: particularly, the material text, historical transitions, social responsibility, and loss. 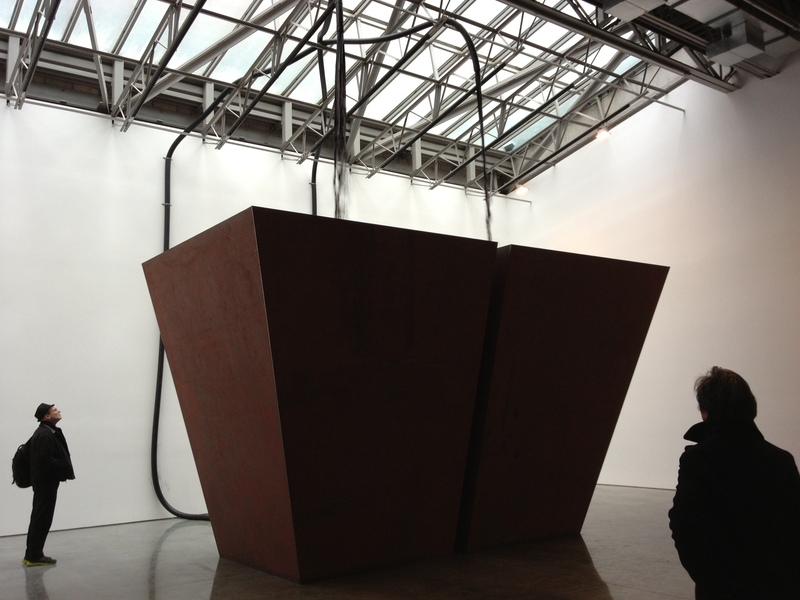 Miroslaw Balka’s “The Order of Things,” at Gladstone, is a “monumental work that draws on historical tragedy to reflect on the limits of the world, continuity, and catastrophe.” Pipes, woven through the ceiling beams, spew a viscous black liquid into two tetrahedral Cor-Ten tubs. Experiencing this work — which felt, for me, very Ellsworth-Kelly-meets-Richard-Serra-meets-Anselm-Kiefer — was a tremendously visceral experience: it felt cold and damp, and it smelled like a mixture of metal and oil. It was like being locked in a room with a huge, imposing embodiment of decay and waste. At least that’s how I read — or, rather, felt — it. 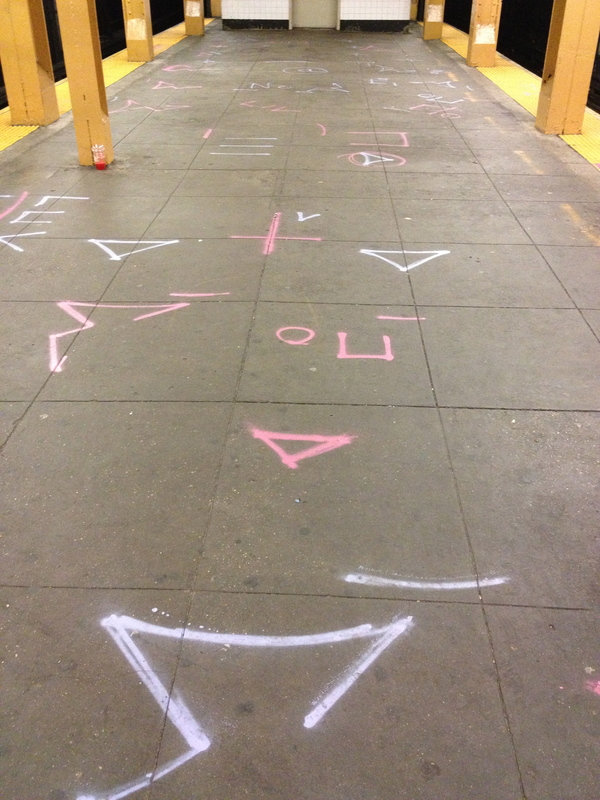 Read more about Balka’s show here. 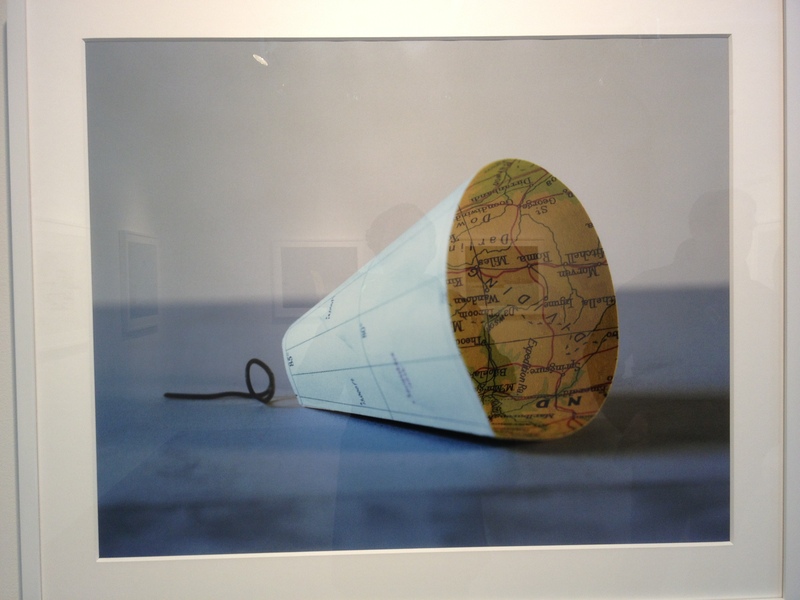 We also saw John Mann‘s “Folded in Place,” lovely photographs of “cartographic objects” (my term) at Daniel Cooney. Mann takes maps and restores to them the third dimension of space that is removed when we make collapse space into a flat representation. But then the photographs of these folded, bent, and flagged objects reduce them once again to two dimensions.